Nope, Motorola hasn't announced this gem at their CES press conference yet, but it's already live on their site - it's called the Droid Bionic, and it's Motorola's LTE phone for Verizon. Of course, it's also got a LTE radio under the hood, as evidenced by the "4G" logo in the top right corner and the "4G-like power" mentioned in the description. Excited? So are we... stay tuned for more as it comes in! Update: It's official! The processor still hasn't been specified, though Motorola claims it consists of two 1 GHz cores, which are capable of providing up to 2 GHz of processing power together. Like the Atrix 4G, you can plug it into your HDTV via an HDMI cable and play your favorite games on the big screen, though it isn't yet clear whether the Bionic will be compatible with the Atrix's laptop dock. Read the full press release below. LAS VEGAS and BASKING RIDGE, N.J. – Verizon Wireless and Motorola Mobility, Inc. (NYSE: MMI), today unveiled DROID™ BIONIC, a powerful new Android™ smartphone. Packing a dual core processor with each core running at 1GHz, delivering up to two GHz of processing power, and 512 MB RAM, the sleekly designed DROID BIONIC smartphone with 4G LTE delivers a mobile Internet experience that’s up to 10 times faster than 3G. This means consumers can stream their favorite music and the latest TV shows with unparalleled quality experience. DROID BIONIC also races through loading of complex web pages and media that take advantage of Adobe® Flash® Player and HTML5, rendering graphics faster than previous generation single-core devices. Motorola’s DROID BIONIC gives new meaning to the word “socialize” by delivering multiple ways for customers to stay connected. With the device’s front-facing VGA camera and See What I See video feature, consumers can share experiences – either via Wi-Fi or 4G – with family, friends and co-workers. A rear-facing 8-megapixel camera also allows consumers to capture their favorite pictures and videos. DROID BIONIC’s multiplayer gaming capabilities allow consumers to challenge friends to live peer-to-peer gaming, viewed through the device’s 4.3-inch qHD quality screen that delivers console-quality graphics. DROID BIONIC’s HDMI connectivity also enables consumers to connect the device to their HD televisions to experience their favorite games, as well as purchased HD content, in full 1080p. 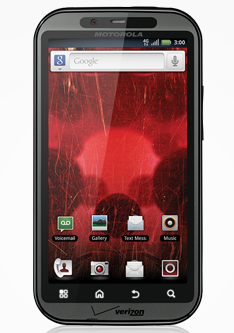 And for multi-taskers, DROID 4G’s Mirror Mode function enables simultaneous streaming of video to the TV and on the device. As a fully featured work device, DROID BIONIC comes equipped with corporate email, remote wipe and data security and encryption capabilities IT departments appreciate. DROID BIONIC also features productivity tools such as Quickoffice® for document review and editing, full calendar management, one-click access to conference calling, and a full suite of Google applications and services.